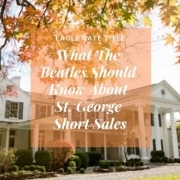 Well, what the Beatles should know about St. George short sales depends on which Beatles we’re talking about. Paul and Ringo are still alive, but they are rarely, if ever, seen in the Saint George, Utah area. And if Paul and Ringo should know about a St. George short sale, they’re either looking for a bargain or they simply love the beauty and climate of Washington County for the next of their many houses. Whether those Beatles are interested in the real estate of Southern Utah is for me to know and for you to find out. (You wouldn’t want me to fall out of their graces for revealing secrets, would you?) Perhaps there are other Beatles who may wish to buy a house in St. George. Beatle-loving entomologists, who changed their name to Beatle or folks born with the surname Beatle are options to pursue a St. George short sale; and while ESPN broadcaster, Michelle Beadles, may love St. George, her name is spelled with a D.
Regardless of which Beatles or blokes are considering a St. George short sale, they should know the following six things. When the owner of a property owes more than it’s worth, he or she may be in the less-than-ideal financial position to sell the property as a short sale. This means that he must get the lender’s permission to sell the house or land for less than what is owed. If the seller convinces the lender that he is in financial hardship and can’t continue to make the mortgage payments, the lender will often agree to a sale of the property for less than the balance of the mortgage. This is preferable to default and foreclosure for the lender, because, for example, $200,000 is better toward a debt of $235,000 than nothing, and foreclosures cost the lenders much more. Selling your house as a short sale is softer on your credit score than a foreclosure is. You can sell the house, get some emotional relief, and move on to preparing to buy another home, with little hit on the Fico. Keep in mind that the longer the lender takes to approve the short sale and the offer from a buyer, the more months you’ll be late on your mortgage payments, which do affect the FICO score. The seller doesn’t have to pay sales commission to the real estate agents; the lender pays them. Because the lender has to approve both the seller’s application for a St. George short sale and also the offers by potential buyers, the sale can take months, usually about 120 days. The number of prospective buyers of short sales is smaller than for typical real estate because of the waiting time. Some buyers simply don’t have months to wait in purchasing a house, so you have less competition when making offers on St. George short sales. When making an offer on a short sale, be aware that because of the likely financial duress of the seller, he may not have been able to maintain the property very well, so it will likely need repairs and fix-ups. 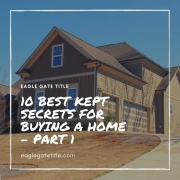 By the time you’re ready to begin the St George closing process, you will have received a document called the closing disclosure form (at least three days prior to your closing date). Review the closing disclosure thoroughly, as it spells out in detail the term and interest rate of your loan, your mortgage payments, any other fees associated with the closing process referred to simply as closing costs (if you’re selling your property or buying using cash, you will receive an ALTA settlement statement for review). In the St George closing process, you can expect closing costs to be somewhere between 2%-7% of the home’s price. If you have questions or spot discrepancies, be sure to communicate them to your lender in addition to comparing the information in the ALTA to the estimate your lender originally gave you. Also, be sure to complete a final walkthrough of the home the day before closing to make sure that the home’s previous occupants have vacated as well as reverifying that the condition of the home is as contractually agreed upon. Any issues that may have arisen as a result of the previously completed inspection should have been completed by this point. 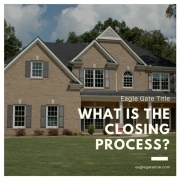 There is nothing wrong with delaying the closing date if necessary. All matters should be resolved before going forward with the St George closing process. There are certain documents that must be present at the closing. You will need to bring a photo ID and your title company will have all your closing documents prepared for you. Note: for those who have just recently been married, your name as shown on your new mortgage and title must be the same as the ID that you bring to the St George closing process. You’ll also need to be prepared to wire transfer your down payment. Also, bring your personal checkbook because smaller fees can sometimes be taken care of at that time with a personal check. 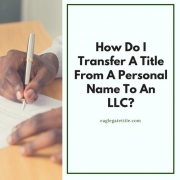 When it’s time to hold the meeting, the title company will have already performed a title search wherein they examine public property records for any potential liens or other issues associated with the property. Such issues are rare, but they do crop up every so often. So who exactly will be present at the meeting that finalizes the St George closing process? You can expect most of the following people to be in attendance: a bank representative, a title company representative, the buyer’s real estate agent, and the buyer. The seller’s real estate agent and the seller will have had a similar but separate meeting. Because so many people are involved in the St George closing process, it’s better to just plan on someone being late or forgetting an important document or spelling a name wrong. A wise practice is to not schedule anything within a few hours after the meeting is scheduled to over, just in case. And remember that at this meeting you will be signing your name a lot. After the St George closing process is complete, the buyer is officially and legally a homeowner! You’ll walk out of there holding a big stack of paperwork and new keys. Exciting! http://eaglegatetitle.com/wp-content/uploads/2019/02/st-george-closing-process.jpg 500 500 aloha http://eaglegatetitle.com/wp-content/uploads/2019/02/logo-300x212.png aloha2019-02-26 16:56:492019-02-27 19:27:36What Is The Closing Process? In most areas, all of the properties that are currently for sale have been canvased and crawled before you found out about them, particularly in the rising St George home market. Make sure that your expectations are realistic. If you keep looking and looking for that one amazing bargain while overlooking ideal options in the process, chances are you will find yourself exhausted, discouraged, and frustrated. Focusing on hidden gems is usually a time waster. The St George home market is booming and you want to do your best to always be ready to pounce with an offer on a new listing that you find appealing. Affordable houses are often hard to come by because they get taken so quickly. If you want to get a head of the competition and give yourself an advantage, visit property listing sites online and sign up for alerts. You customize your own criteria so you’ll know the moment and ideal home becomes available. Another thing you can do is get yourself a realtor who is proactive, knows the St George home market, and will help you make first offers. Try and find one who is part of a good firm because they often get preferential treatment from fellow realtors who also work in similar renown firms. There is a very good reason why exploring multi-family homes is a really good option, even if it’s not what you were originally looking for, particularly for first-time home owners. When you own a multi- family home, it is often as affordable as renting. Purchasing a home with multiple units allows you to live in one and rent out the others, driving down your personal mortgage cost as you’ll have money being provided by tenants. Buyer’s markets begin to emerge during the winter months as the market slows down. This means that, generally, sellers in the St George home market tend to be more open to negotiation during this time. Being active as a buyer during off-peak seasons also helps you to bypass the hectic spring St George home market which is usually accompanied by stress as well as aggressive bidding wars. Be sure to consider homes for sale in nearby cities and not only major metropolitan areas. Searching in non-brand name towns (as they are sometimes called) almost always have lower housing costs. This is due to the fact that these areas have a much lower public profile and don’t get as much real estate attention as the bigger areas in the St George home market. If you’re looking for a the best deal you can find, you’re more likely to find it in these areas. Being aggressive means that you are alert at all times, that your dedication to finding the right property for you in the St George home market is resulting in first offers. Setting up alerts and notifications as mentioned above is part of being aggressive, as is talking with people often, discovering and digging for information. Ask everyone you know if they are aware of properties for sale. Facebook and other social media sites have real estate-related groups you can join. Do everything you can and don’t give up. Even if you feel like you don’t have a large enough income to become a homeowner, it can still happen with proper patience and time. Check your credit and get pre-approved for a loan and start searching. 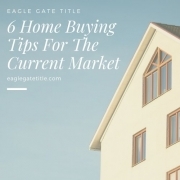 And, as usual, contact a representative from Eagle Gate Title for answers to questions about the St George home market and we’ll help you in any way that we can. 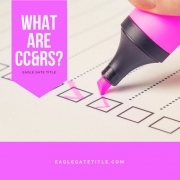 CC&R stands for Declaration of Covenants, Conditions, and Restrictions. It is a list of mandatory requirements that apply to all who live inside the boundaries of a particular homeowner’s association (HOA). HOAs typically exist in covenanted and planned communities. Essentially, St George CC&Rs are lists of neighborhood rules. If you buy a home in a community like this, it is more than likely that CC&Rs will apply. Some of you may already live in such a community and are familiar with the types of statutes that St George CC&Rs tend to contain. 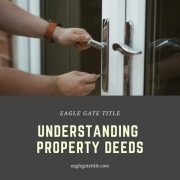 Not only do they lay out general neighborhood rules, but they also describe the limitations of property ownership such as what you can and cannot do with your home and property. The idea behind a CC&R is the prioritization of community property values. They act as a special effort to preserve and protect these values by creating a level of uniformity among homeowners. For the most part, requirements found in St George CC&Rs are sensible and logical and require very little effort to conform. Things that most homeowners do regularly anyway, such as weekly lawn-mowing and weed-pulling, are common examples. Some St George CC&Rs, on the other hand, contain rules that seem completely unreasonable and unnecessary. Examples can include being required to park your car in the garage even though you have a perfectly acceptable and functioning driveway, or being not being allowed to construct a fence around your property, or being limited to only certain sizes and/or breeds of dogs. Many St George CC&Rs even have restrictions on certain paint colors when it comes to painting your own home and other similar constraints. Basically, homeowners who live in communities with active CC&Rs need to always be in the habit of checking them to assure compliance even in the most seemingly ordinary activities such as gardening and remodeling. When you close on your home, you will sign a lot of paperwork. One of the documents that will require your signature is one stating that you agree to comply with the CC&Rs that your HOA has set forth (if applicable). Violating the covenants, conditions, and restrictions of your HOA will most certainly result in one of many potential consequences which can include a lawsuit against you, forced compliance, privilege suspension (pool, gym, etc), fines, and any other possible repercussion that your HOA has specified. To give an example, we’ve found that common CC&Rs that defiant homeowners often try to skirt are the ones relating to pets. If your HOA restricts pets to 30 pounds or less and you attempt to hide your Great Dane (somehow) and are subsequently found out, it is likely that the HOA will fine you and/or require you to get rid of Duke, or otherwise move out of the community. Just make sure that before buying a home in a community with an HOA and St George CC&Rs that you’ve read them all. There very well could be something on that list that prevents you from moving in. Contrarily, there might be a CC&R that is so personally attractive that it persuades you to move there. St George CC&Rs are almost always associated with monthly or annual dues. Covenanted communities require all residing homeowners to pay these fees on a regular basis. The dollar amount varies between communities, as do non-payment penalties and other assessments that the HOA deems applicable. In situations of non-payment, homeowner’s associations can legally get a lien on your home and threaten foreclosure if the St George CC&Rs articulate such an outcome. Anyone who finds themselves in such a situation has the option to contact a lawyer if they feel HOAs are being unreasonable, hypocritical, or unnecessarily harsh. http://eaglegatetitle.com/wp-content/uploads/2019/02/st-george-ccrs.jpg 500 500 aloha http://eaglegatetitle.com/wp-content/uploads/2019/02/logo-300x212.png aloha2019-02-26 16:56:492019-02-27 19:31:29What Are CC&Rs? The death of a spouse is an event that often requires the surviving member of the relationship a lot of business to take care of, unfortunately, on top of the grief from losing a loved one. Though one finding oneself in this situation is comparatively common, that certainly does not mean that it is easy. At Eagle Gate Title, we have extensive experience helping Southern Utah folks in this scenario. We know that dealing with a St George title is likely the last thing that anyone wants to be doing in the midst of a tragedy so we want to do everything we can to help and relieve however many burdens as possible. 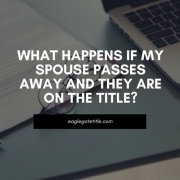 Here is some important information to understand if you or someone you know has a recently deceased spouse on a St George title. There are different ways that a married couple can own property together. One of those ways is as joint tenants with rights of survivorship. This means that in the event of death, the St George title belongs to the living spouse. They become the sole owner. Without rights of survivorship in place, the property rights are divided in half; half to the estate of the deceased and half to the living spouse. In this scenario, hopefully there is a will and testament in place for the deceased that has been probated, otherwise the living spouse may not be able to obtain the St George title immediately or (in some cases) state law will determine the outcome. Some married couples have joint title ownership in the following way: one spouse has a life estate in the property and the other has fee simple interest in it, meaning that that spouse owns the St George title outright. 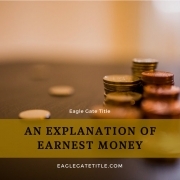 To further explain, perhaps one member of the relationship has kept a life estate for themselves and deeded to their spouse their property interest, or maybe their spouse has deeded a life estate interest to them for property that they previously owned. Whichever it may be in any given circumstance, a person who owns a life estate in the property of their deceased spouse, they only have the right to live there (or posses it) until their own death. In a situation where the husband passes away and the wife owns the life estate, the children may have the St George title passed to them but would require a court action to terminate their mother’s ownership. In most cases, a widow cannot mortgage/lease the property or otherwise sell any rights whatsoever unless the life estate that she holds is what is called an enhanced life estate. Even if that is the case, she must live in a state where that is recognized. If the widow desires full selling power until the time of her death, an enhanced life estate is required. The St George title goes through the wife’s estate if she passes away before her spouse and survivorship provisions have not been included in their deed. It doesn’t matter if there is a will or not, the estate can be administered in probate court or simply probated. If beneficiaries have been named in the deceased wife’s will, her property will pass to them. If there is no will, the heirs of the deceased will have the St George title passed to them. The deceased’s living husband is legally an heir in this scenario, but the laws of the state where the property is located will ultimately determine the amount of property he is granted. In the event where there are no survivorship provisions in the deed, it is possible that the surviving husband could become joint owners with his wife’s siblings, parents, or children from a previous marriage. In the event that the husband does not wish to acquire the St George title or any shares of property of his late wife even though survivorship provisions are contained in the deed, he can file a disclaimer of interest. When this is done, the existing survivorship provisions are cancelled and the shares that were granted to him are transferred into the estate. http://eaglegatetitle.com/wp-content/uploads/2019/02/st-george-title.jpg 500 500 aloha http://eaglegatetitle.com/wp-content/uploads/2019/02/logo-300x212.png aloha2019-02-26 16:56:492019-02-27 19:34:34What Happens If My Spouse Passes Away And They Are On The Title?